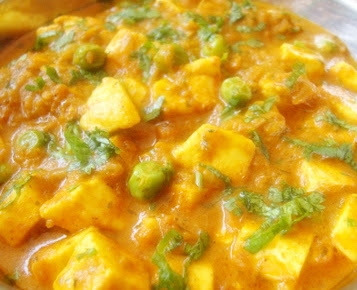 Matar Paneer (Matar = Green Peas and Paneer = Cottage Cheese) is one of the most popular dishes in North India. It is a sumptuous looking dish with an irresistible aroma, with Cottage cheese cubes and peas floating temptingly in a flavorful tomato-based gravy. Matar Paneer is usually made with cream & lots of oil, but instead I use curd and much lesser oil to meet my health-nut husband's exacting standards. This healthy variation still retains the same yumminess as the original cream-based recipe. Dice cottage cheese into one inch cubes. Microwave the peas till they are tender. Heat oil in a pan on medium heat. Add cumin seeds. When the cumin seeds begin to change color, add the onions. Saute till the onions are light brown in color. Add ginger & garlic paste. Saute for 2 minutes. Add tomato puree. Saute till the oil starts to separate. Add coriander powder, turmeric powder, red chilli powder & salt. Saute for 2 minutes. Add water & mix. Cook till the water comes to a boil. Add green peas, curd, dried fenugreek leaves, green chillies. Mix. Reduce the heat & cook till the gravy thickens. Add cottage cheese, garam masala powder. Mix well. Adjust seasoning to your taste. Transfer it to a bowl. Garnish with cilantro leaves. Serve hot with roti, parathas or rice. To add an extra zing to your Matar paneer, add 2 tbsp of Green Chutney instead of dried fenugreek leaves.